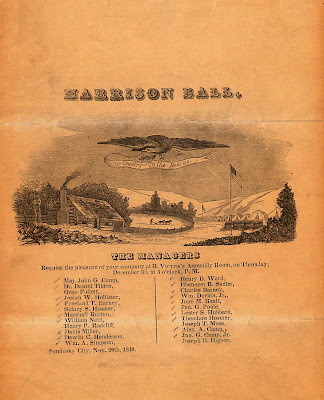 An invitation to the Harrison Ball of 1840 is on file at the Archives Research Center of the Sandusky Library. 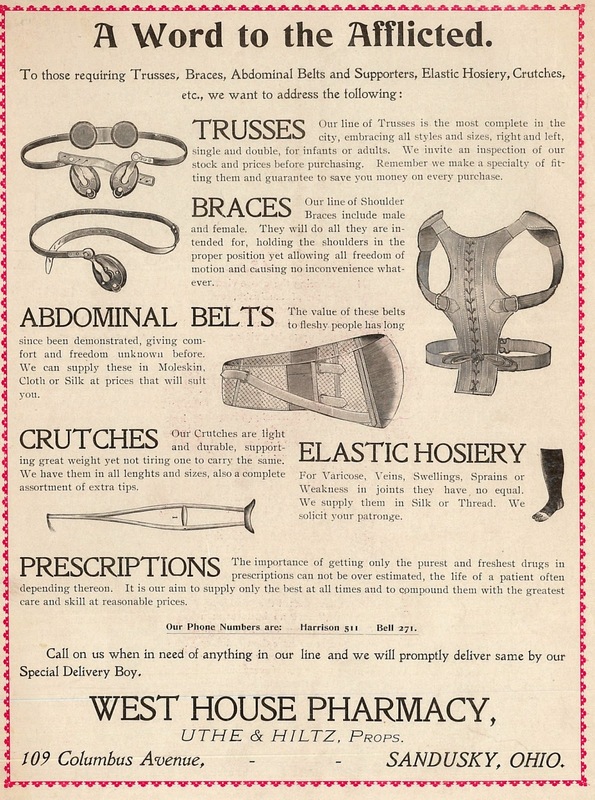 The ball was to be held at H. Victor’s Assembly Room on Thursday, December 31 at 5 p.m. This New Year's Eve festivity was in honor of William Henry Harrison, a fellow Ohioan, elected President earlier that year. Josiah W. Hollister Wm. Durbin, Jr.
Dewitt C. Henderson Jno. G. Camp, Jr. The list of names of people serving as managers of the Harrison Ball reads like a “Who’s Who” of early Sandusky. Major John G. Camp, Sr. fought in the War of 1812, and was active in the early years of Sandusky. 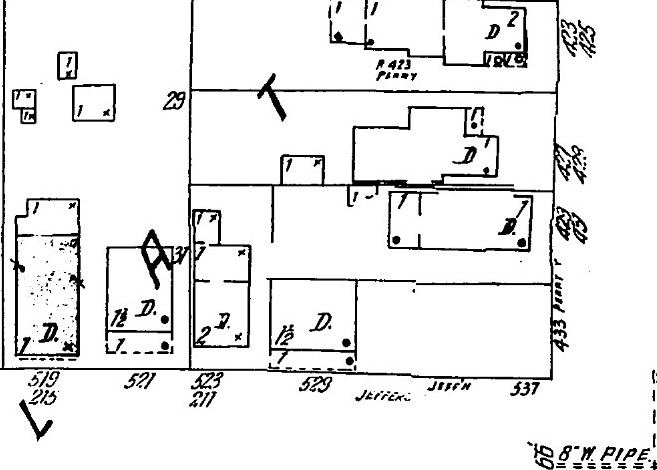 Helen Hansen wrote in her book At Home in Early Sandusky, that Major Camp, along with Isaac Mills, Thomas Neill, and William Reese, laid out the addition known as “Southwark,” which was south of Monroe Street and west of Sycamore Line. 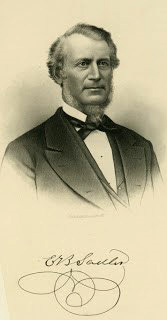 John G. Camp, Jr. was an attorney in Sandusky, and he devoted a great deal of time negotiating plans for early railroad transportation in Ohio. 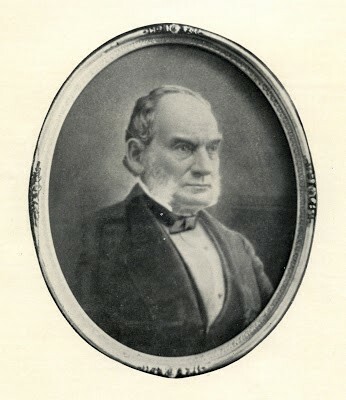 Sidney S. Hosmer was an early Sandusky merchant, while his son Theodore Hosmer went west and became the first mayor of Tacoma Washington. 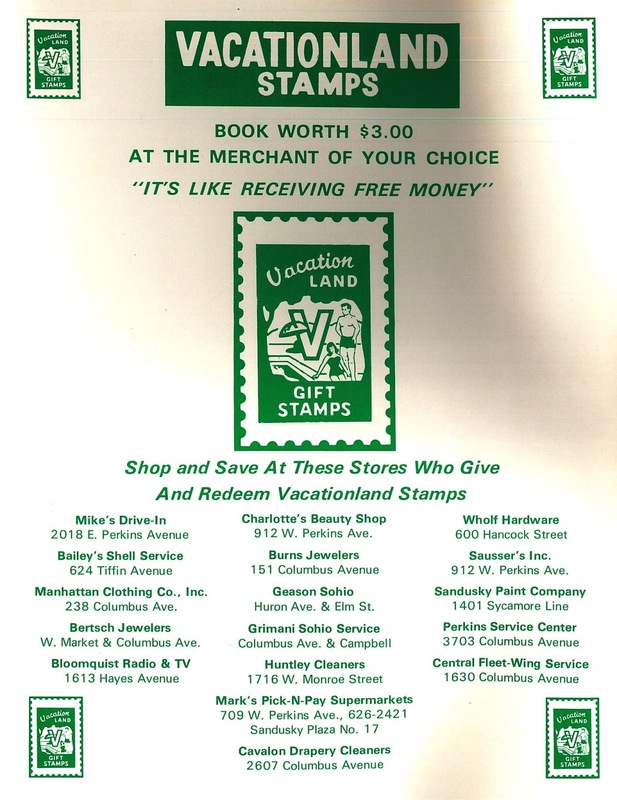 Lester S. Hubbard was a banker and prosperous businessman in Sandusky. 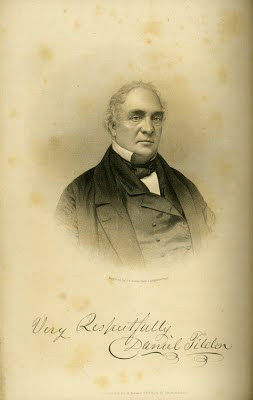 Henry Clay Victor, whose Assembly Room was the location of the ball, was the father of Orville James Victor, author and editor. 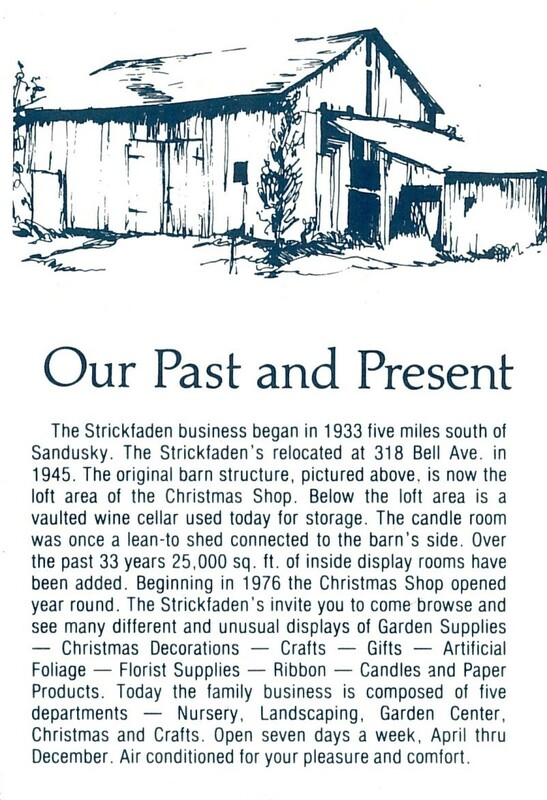 To learn more about these and many other early residents of Sandusky and Erie County, visit the Archives Research Center. 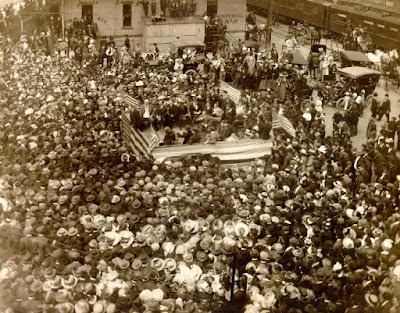 Here you will find county histories, historical journal and newspaper articles, and finding aids to the many archival resources available at the Sandusky Library. Winifred Breining, One of Sandusky’s "Fair Daughters"
Winifred Katherine Breining was born in Sandusky on May 17, 1891 to William and Mary Breining. 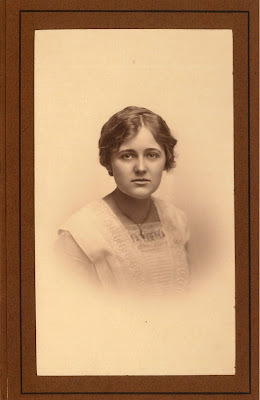 Winifred served as class secretary during her senior year at Sandusky High School, graduating with the class of 1909½. After attending Ohio University, she became an elementary teacher at Monroe School. 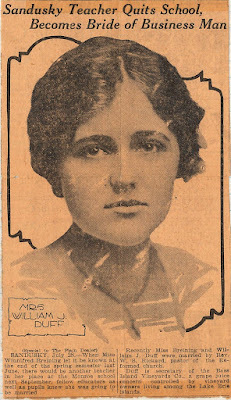 During the early 1910s, the Sandusky Register ran a series of photographs of Sandusky’s popular young ladies. The series was known as “Fair Daughters of Sandusky.” The portrait above, taken by W.A. Bishop was displayed in the window of the Bishop photographic studio on Washington Row in Sandusky. 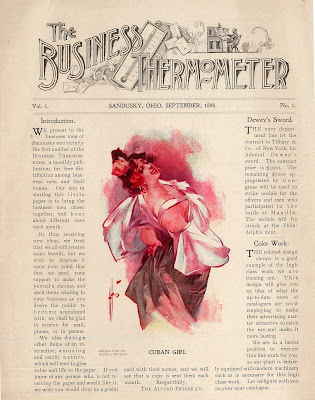 A copy of her portrait also appeared in the Cleveland Plain Dealer newspaper, when her engagement was announced. 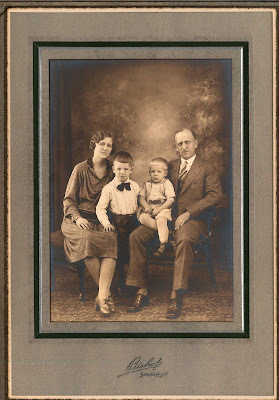 Descendants of William and Winifred Duff donated several family pictures to the Sandusky Library Archives Research Center. William Duff passed away in 1948. 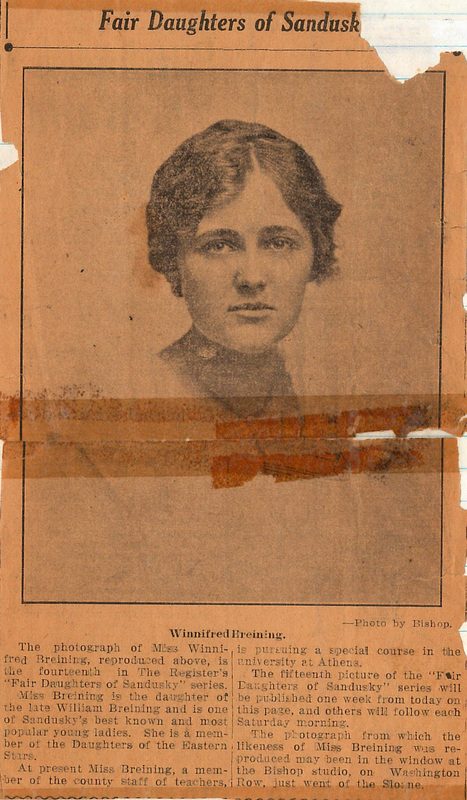 Winifred Breining Duff died in June of 1959. Both Mr. and Mrs. Duff were buried in Oakland Cemetery. 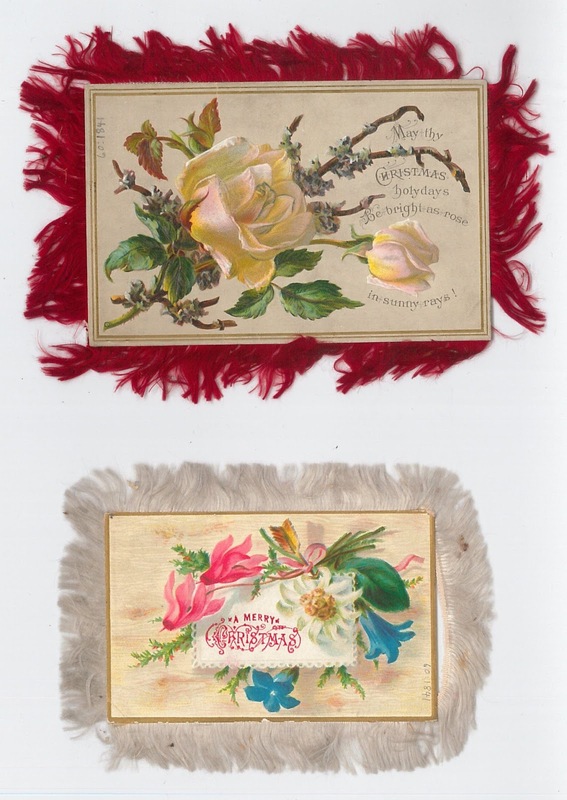 Wishing everyone Happy Holidays with some nineteenth century Christmas cards from the collections of the Sandusky Library Archives Research Center. You can see that at this time, instead of evergreen trees, gifts, and stockings, the cards were decorated with images of flowers. 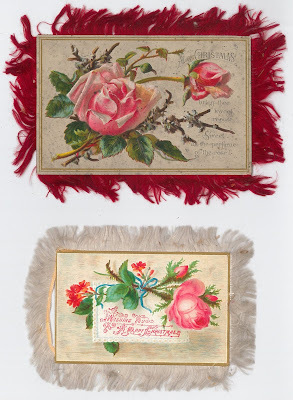 Fringe is attached all around the cards. Perhaps your ancestors received holiday cards like these! You can read about the history of Christmas cards and other greetings cards in the book Encyclopedia of Ephemera, by Maurice Rickards (Routledge, 2000), available for loan from the Sandusky Library. 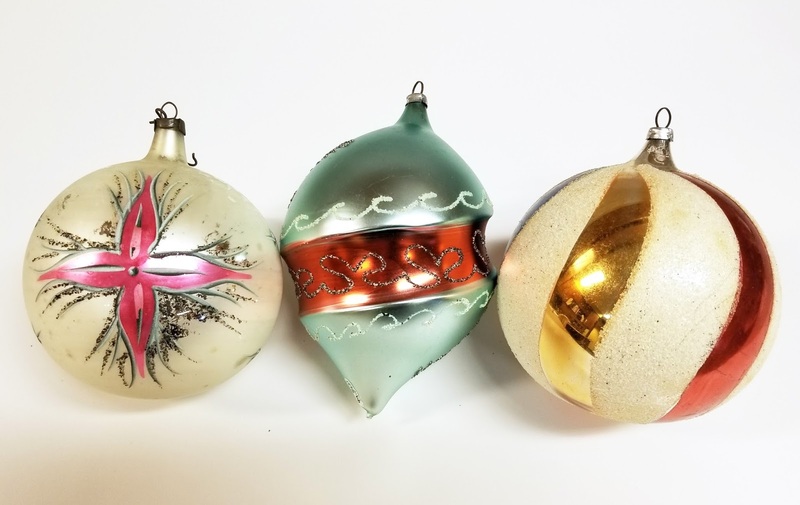 Several boxes of German glass ornaments purchased at Strickfaden’s are now in the historical collections of the Follett House Museum. 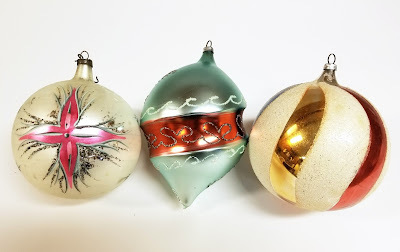 The three ornaments pictured above were dated from 1948. An advertisement for Strickfaden’s appeared in the WLEC Special Historical Edition Cookbook which was published in 1978. 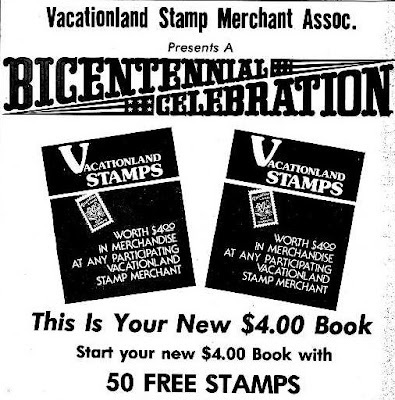 The advertisement provided historical information about the popular garden center, which is no longer in operation. 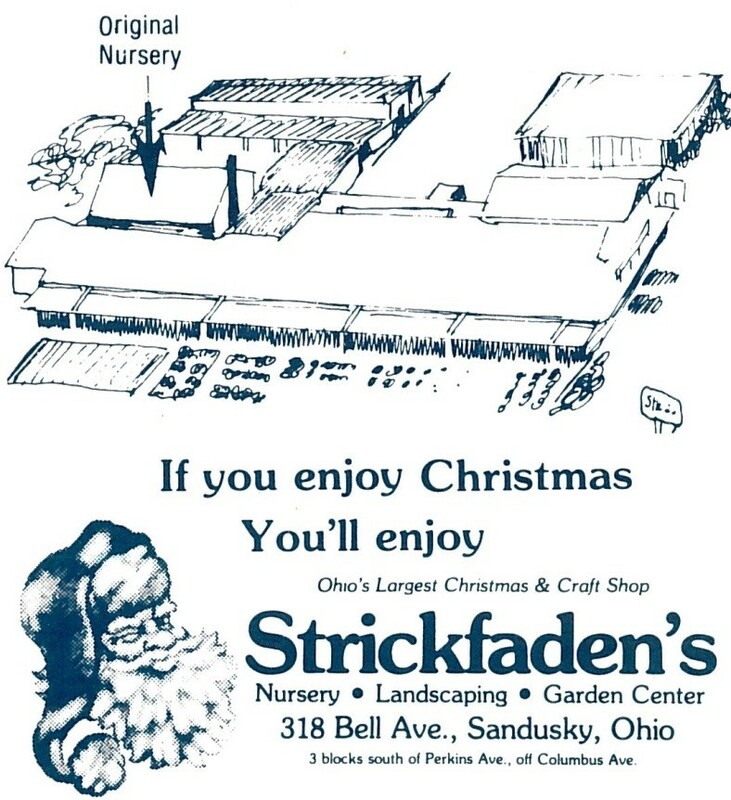 The talking Santa was just one of the many attractions enjoyed by local families who shopped at Strickfaden’s. 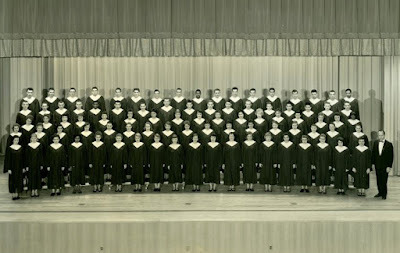 This is the Sandusky High School A Capella Choir during the 1957-1958 academic year. 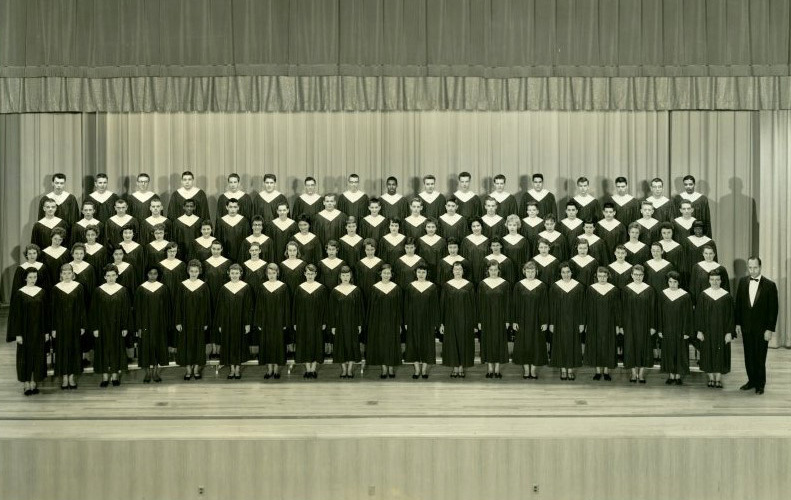 The A Capella Choir was organized in 1934 by Miss Eulalie Shaw. In 1947 the Choir was heard over a local radio broadcast for the first time, and the Sandusky Rotary Club presented the choir with thirty-seven handbells in 1960. The fiftieth annual Christmas concert was presented by the A Capella Choir of Sandusky High School on December 19 and 20, 1983. Over twenty holiday songs were sung at the concert, with the final number being the Hallelujah Chorus from the “Messiah,” which was dedicated to the memory of former choir director Harold C. Kaufman. 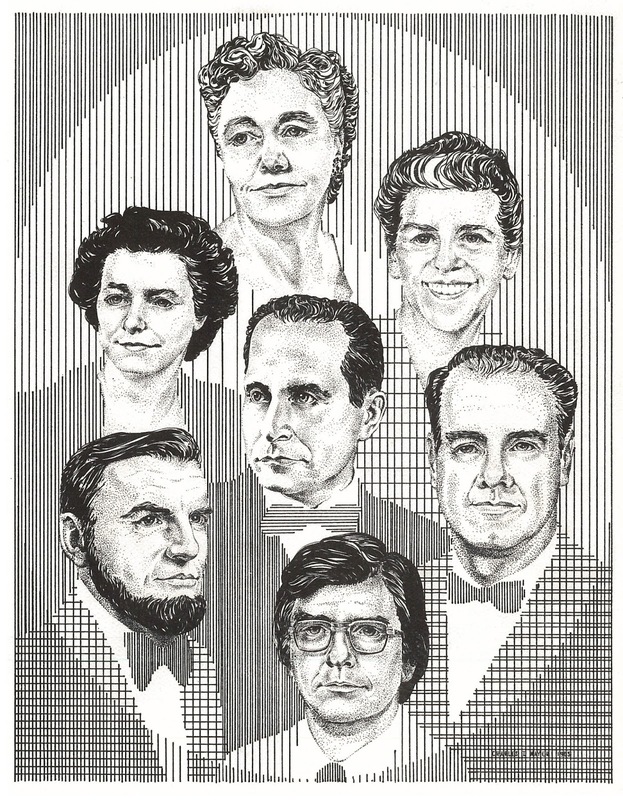 A special program was created for the Golden Anniversary concert of the Choir was created by Mr. Charles T. Mayer. 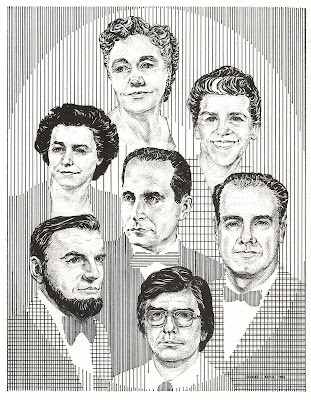 It featured drawings of the directors of the A Cappella Choir from 1934 to 1983. 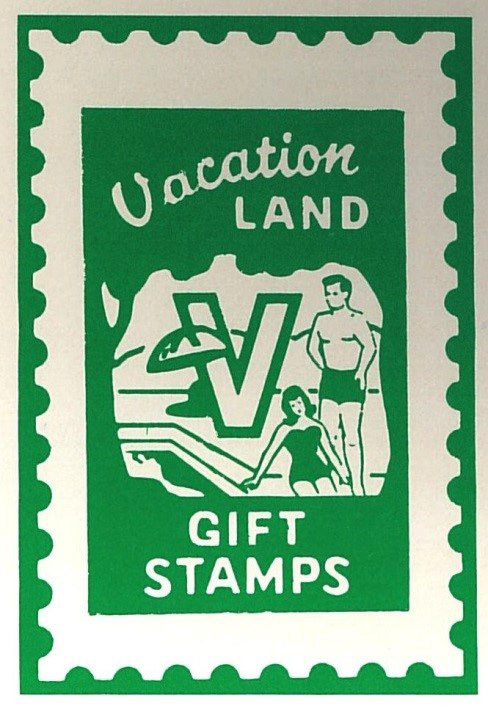 This key to the illustrations appears inside the front cover of the program. A history of the A Capella Choir is found in the 50th Anniversary program, along with the story of the Sandusky High School choir robe. The first robing ceremony took place in 1953. Visit the Sandusky Library Archives Research Center to learn more about the rich history of the Sandusky City Schools. Several archival boxes are devoted to graduation programs, photographs, and many other historical items. Concerts by Sandusky City School students in band, choir, and elementary music classes have been enjoyed by local residents for many years. 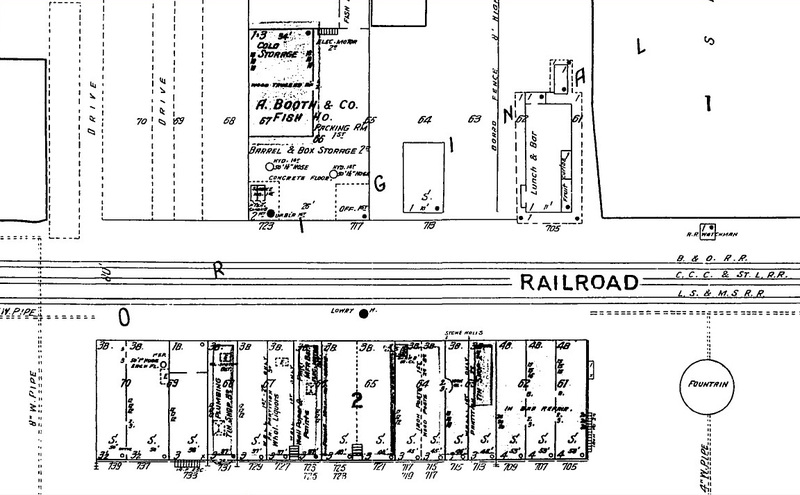 Beginning in the 1850s, when a landfill project added more land to downtown Sandusky, moving the shoreline well north of Water Street, railroad lines traveled along the north end of downtown Sandusky, along the bay. This view of the foot of Columbus Avenue was taken from the water, around 1900-10. 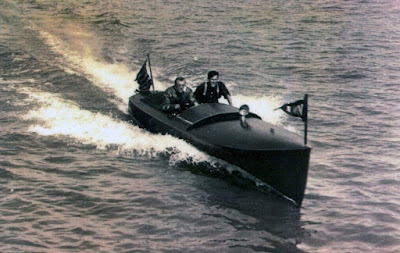 Sandusky’s waterfront has been the hub of a variety of modes of transportation in Sandusky, including horse and buggies, boats, trains, the interurban, and later automobiles, motorcycles, and even Segwave tours. The West House hotel was popular with tourists in Sandusky for many years. The State Theatre is now at the site of the former West House hotel. Below, we see the train tracks on Railroad Street (now Shoreline Drive) in downtown Sandusky about 1908. 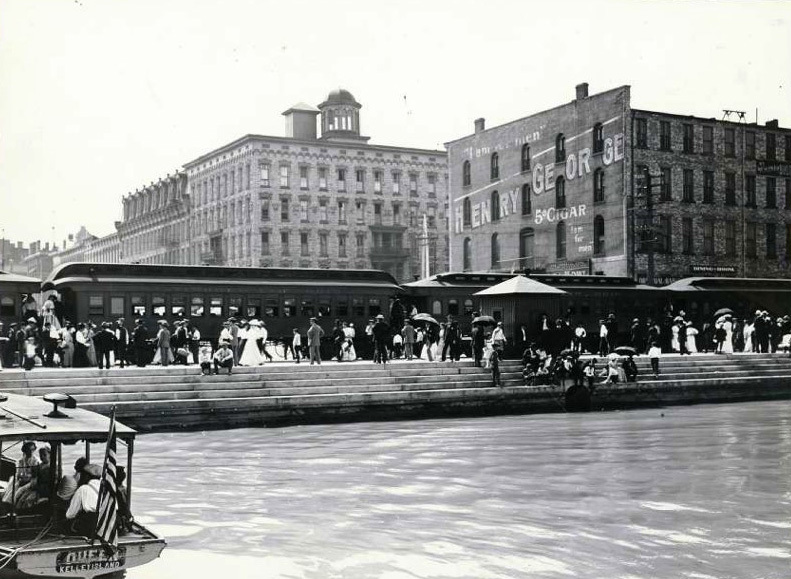 The A. Booth and Company’s fish house and the Johnson’s Island boat landing were just north of the tracks. A water tower on the roof of the Hinde and Dauch factory is visible in the distance. 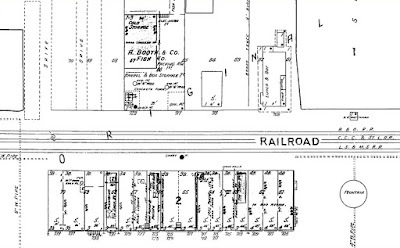 The 1905 Sanborn Map shows three different railroads in operation through downtown Sandusky at that time: the Baltimore and Ohio, the Cleveland, Cincinnati, Chicago and St. Louis Railway Company (later known as the “Big Four”), and the Lake Shore and Michigan Southern Railway. A recent view of this location can be seen at Google Maps. Society has changed in many ways throughout the last one hundred years, but downtown Sandusky remains a popular destination for visitors and area residents alike. Visit the Sandusky Library to learn more about the city of Sandusky’s rich history. 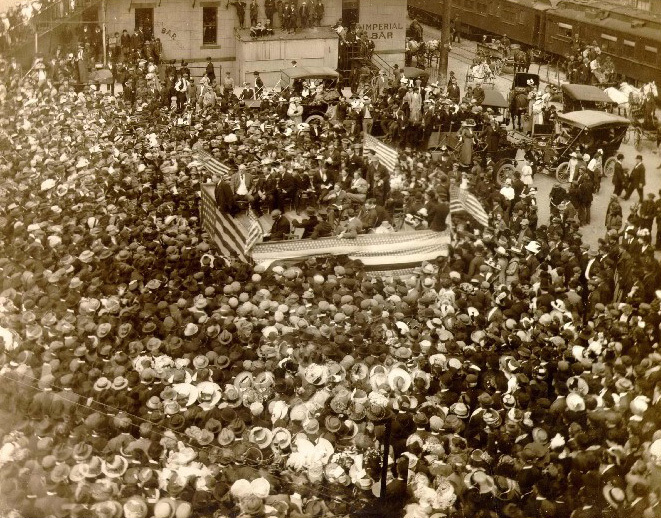 The website of the Erie County Historical Society hosts several historic walking tours of sites around town. 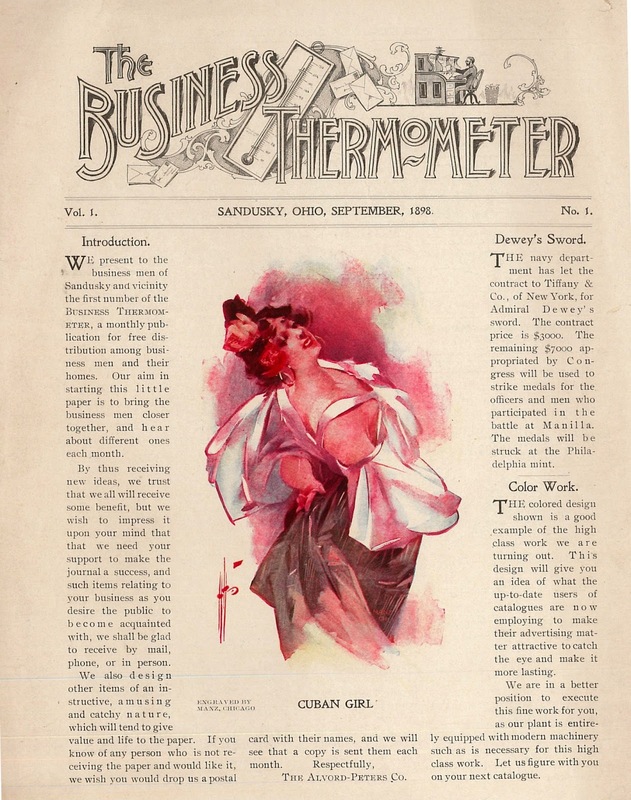 In September of 1898, the Alvord-Peters Company (publishers of the Star Journal newspaper) published The Business Thermometer. It was a series of free monthly publications, promoting businesses in Sandusky. 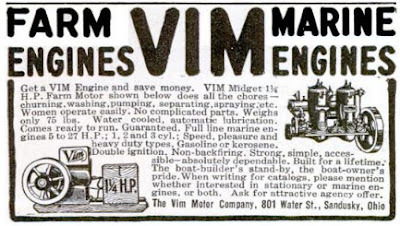 To date, only one issue has been found in our historical files. 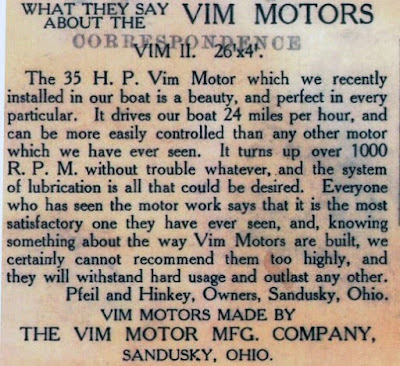 In a column called Trade Notes, various products made in Sandusky were highlighted. 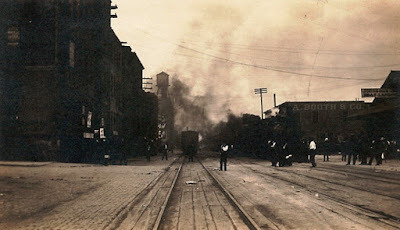 In the editorial section, the publishers suggested that additional streets in Sandusky should be paved, since the paving of Wayne Street was completed. 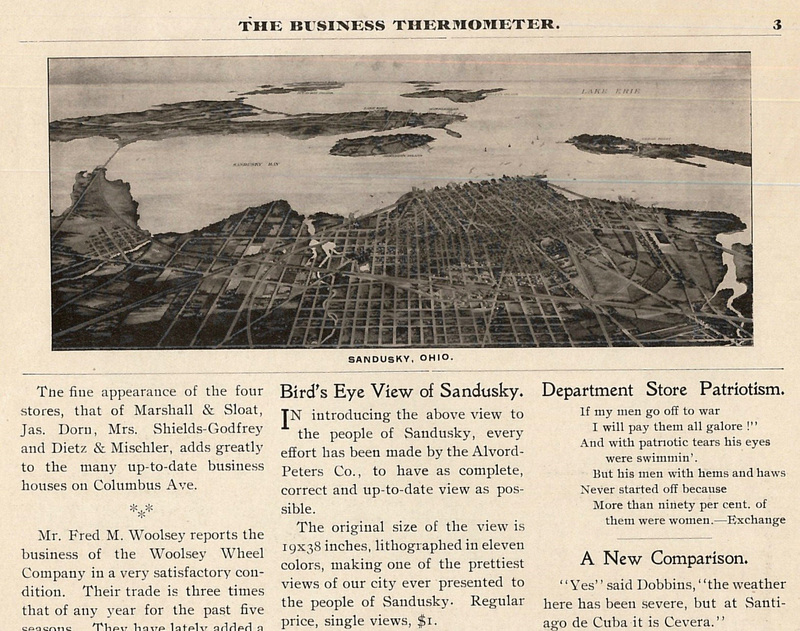 In 1898, the Alvord-Peters Company advertised selling prints of a lithograph “Bird’s Eye View of Sandusky.” The print was 19 by 38 inches, and sold for $1.00 (about $30 in today's money). 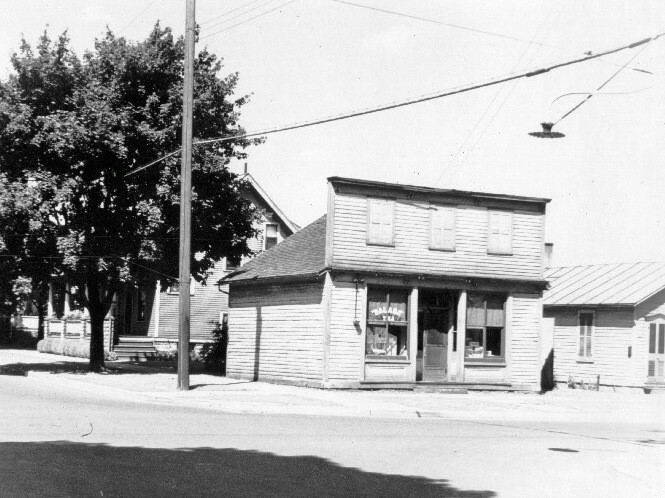 A copy of the print is on display at the Follett House, and an enlargement of this image is located in the Adams Street entrance of the Sandusky Library. 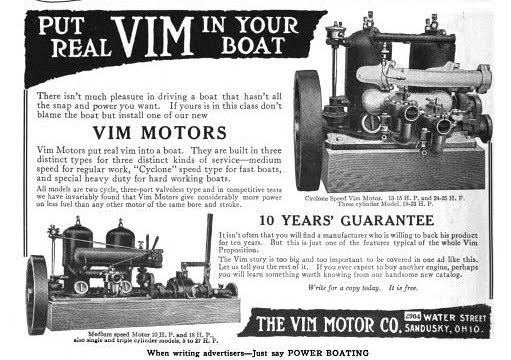 The boat above, owned by Ed Hinkey and a Mr. Pfeil in 1911, was powered by a 35 horsepower motor manufactured by the Vim Motor Company. On the reverse side of this picture postcard is the owners' positive description of the Vim Motor and its performance. During World War I, the Vim Motor Company merged with the Sandusky Forge Company, and began manufacturing munitions for the war effort. 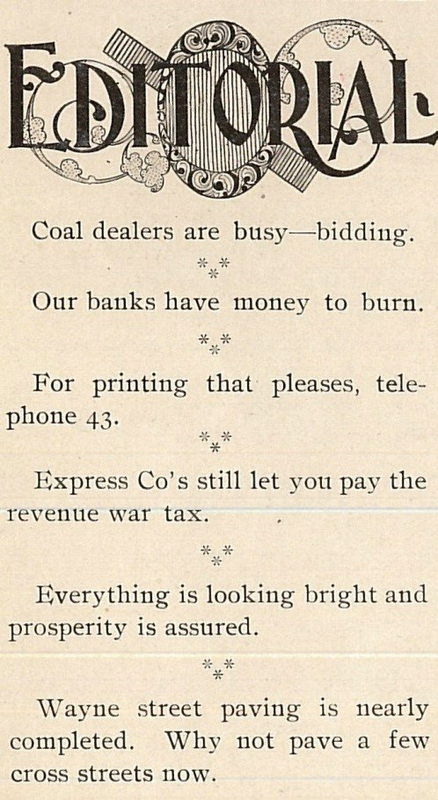 After the war’s end, the company faltered, and went into receivership in 1920. 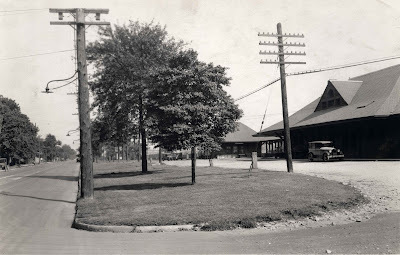 In the 1950s, Ruby’s Fisheries was located at the site of the former Vim Motor Company, now the parking lot for the Erie County Senior Center. From about 1900 until his death in 1932, William J. Schweinfurth ran a small neighborhood grocery store at the northwest corner of Perry and Jefferson Streets. Mr. Schweinfurth and his family lived just around the corner, at 529 East Jefferson Street. 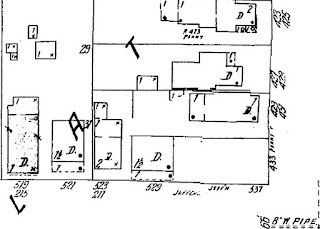 You can see both the address of the grocery store, at 433 Perry Street, as well as the Schweinfurth residence on Jefferson Street in this close-up view from the Sanborn Map. 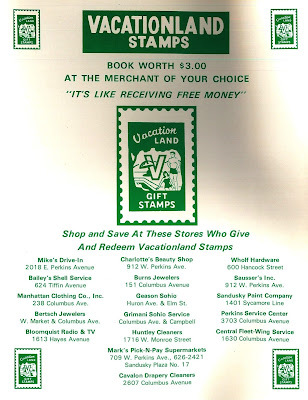 The Schweinfurth grocery store was one of several stores that were part of the Home Service Stores group. 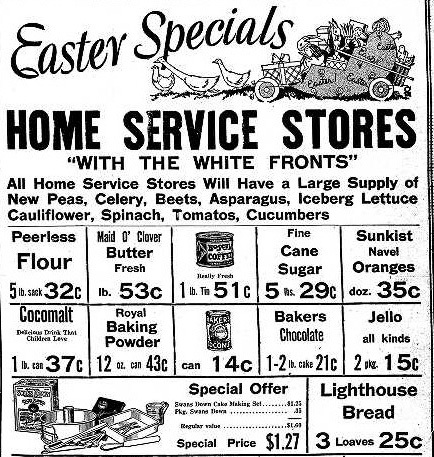 The Home Service Stores were a group of individually owned grocery stores which organized for the purpose of collective buying. This organization was in existence in the Sandusky area from 1923 through the early 1950s. 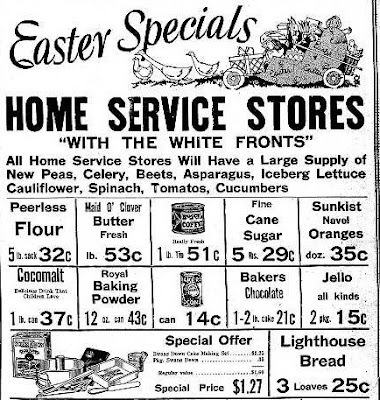 On March 29, 1930, an advertisement in the Sandusky Star Journal featured several Easter specials on sale at local Home Service Stores, including the William Schweinfurth grocery. In the window of the Schweinfurth grocery store in the photo above is a sign for Salada Tea, which was a popular product at that time. 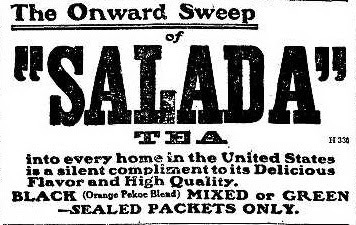 Salada Tea advertised heavily in newspapers in the twentieth century, including newspapers published in Sandusky. 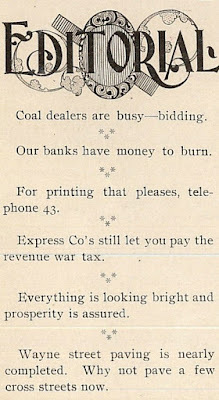 The ad below appeared in the Sandusky Star Journal of November 17, 1922. 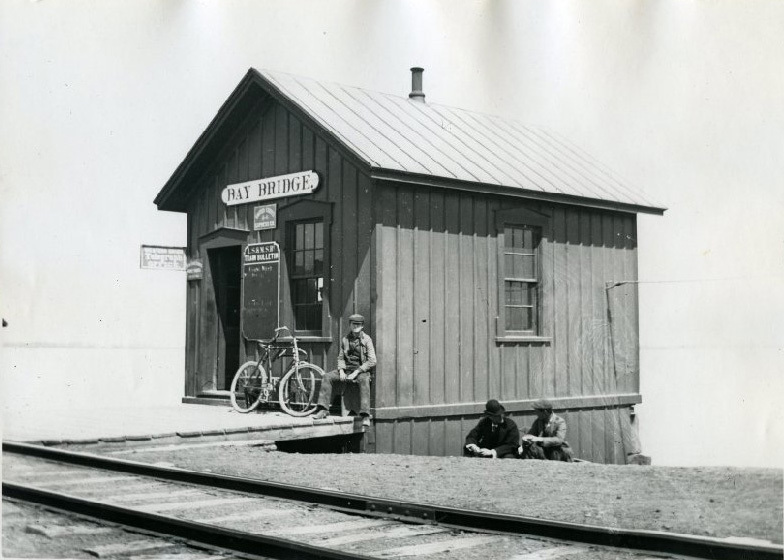 Ernst Niebergall took this picture of the New York Central Depot in Sandusky in 1920. 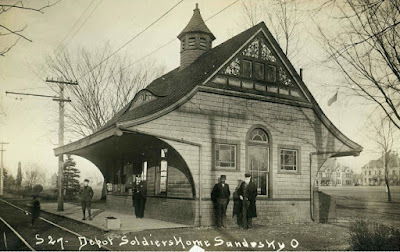 This depot still stands today, where it also serves as home to the Sandusky Transit System. The Lake Shore and Michigan Southern railway built a small depot in Bay Bridge, Ohio in the 1870s. A telegraph office was also at this location for many years. 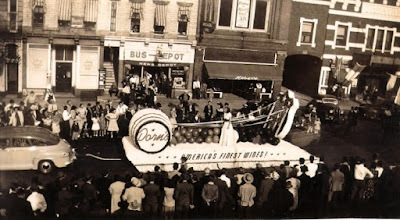 Greyhound’s bus depot was on Columbus Avenue in 1939, between Joe Weske’s barber shop and Weber’s men’s clothing store. 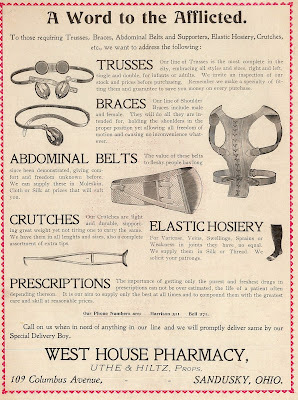 Newspapers were also sold at the bus depot. 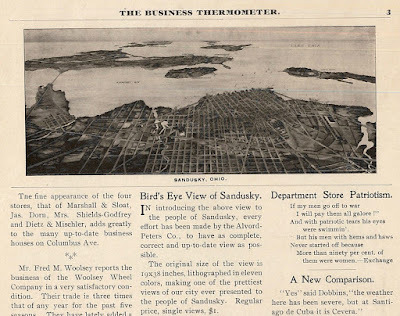 To view more vintage pictures of Sandusky and Erie County, visit the website of the Sandusky Library’s Past Perfect Local History Archives.